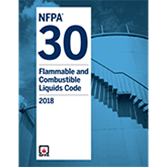 Apply the 2018 edition of NFPA 30 for better protection around flammable and combustible liquids. Enforceable under OSHA and many state and local regulations, NFPA 30: Flammable and Combustible Liquids Code is the best practice widely used in industry and by insurers. The 2018 edition of the Code includes the latest and most complete criteria you need to protect your facility by ensuring safe storage, handling, and use of flammable and combustible liquids. Get the criteria you need to design your facilities to comply with sprinkler requirements and use safe operating practices. Interested in other editions of the NFPA 30? Use the drop down menu above to select the edition year you need. 1.6 Symbols, Units, and Formulas. 4.2 Definitions Specific to Chapter 4. 4.4 Determination of Flash Point. 6.2 Definitions Specific to Chapter 6. 6.3 Management of Fire and Explosion Hazards. 6.5 Control of Ignition Sources. 6.6 Detection and Alarm Systems and Procedures. 6.7 Fire Protection and Fire Suppression Systems. 6.8 Emergency Planning and Training. 7.4 Application of Area Classification. 9.2 Definitions Specific to Chapter 9. 9.5 Flammable Liquids Storage Cabinets. 9.6 Maximum Allowable Quantities (MAQs) per Control Area. 9.8 Classification of Occupancies That Exceed the Maximum Allowable Quantities of Liquids per Control Area. 9.13 Containment, Drainage, and Spill Control. 9.17 Separation from Incompatible Materials. 9.18 Dispensing, Handling, and Use of Liquids in Storage Areas. 9.19 Outdoor Storage of Liquids. 10.13 Containment, Drainage, and Spill Control. 10.17 Separation from Incompatible Materials. 10.18 Dispensing, Handling, and Use of Liquids in Mercantile Occupancies. 10.19 Outdoor Storage of Liquids. 12.2 Definitions Specific to Chapter 12. 12.6 Maximum Allowable Quantities and Maximum Storage Heights. 12.13 Containment, Drainage, and Spill Control. 12.17 Separation from Incompatible Materials. 12.18 Dispensing, Handling, and Use of Liquids in Storage Occupancies. 12.19 Outdoor Storage of Liquids. 13.6 Maximum Allowable Quantities and Maximum Storage Heights. 13.13 Containment, Drainage, and Spill Control. 13.17 Separation from Incompatible Materials. 13.18 Dispensing, Handling, and Use of Liquids in Detached, Unprotected Buildings. 13.19 Outdoor Storage of Liquids. 14.4 Design and Construction of Hazardous Materials Storage Lockers. 14.5 Designated Sites for Hazardous Materials Storage Lockers. 15.4 Outdoor Storage Adjacent to a Building. 16.2 Definitions Specific to Chapter 16. 16.4 Automatic Sprinkler and Foam-Water Sprinkler Fire Protection Systems. 16.5 Fire Protection System Design Criteria. 16.6 Fire Protection System Design Schemes. 16.8 Containment, Drainage, and Spill Control. 16.9 Other Automatic Fire Protection Systems. 17.4 Location of Process Vessels and Equipment. 17.10 Containment, Drainage, and Spill Control. 17.14 Process Equipment and Vessels. 17.15 Management of Operations Hazards. 18.4 Dispensing, Handling, Transfer, and Use. 18.6 Ventilation for Dispensing Areas. 19.2 Definitions Specific to Chapter 19. 19.4 Recirculating Heat Transfer Systems. 19.5 Vapor Recovery and Vapor Processing Systems. 19.7 Cooking Oil Storage Tank Systems in Commercial Kitchens. 21.2 Definitions Specific to Chapter 21. 21.4 Design and Construction of Storage Tanks. 21.5 Testing Requirements for Tanks. 21.6 Fire Prevention and Control. 21.7 Operation of Storage Tanks. 21.8 Inspection and Maintenance of Storage Tanks and Storage Tank Appurtenances. 21.9 Change of Stored Liquid. 22.2 Definitions Specific to Chapter 22. 22.4 Location of Aboveground Storage Tanks. 22.5 Installation of Aboveground Storage Tanks. 22.6 Vent Piping for Aboveground Tanks. 22.7 Emergency Relief Venting for Fire Exposure for Aboveground Storage Tanks. 22.8 Fire Protection for Aboveground Storage Tanks. 22.9 Additional Requirements for Fire-Resistant Aboveground Storage Tanks. 22.10 Additional Requirements for Protected Aboveground Storage Tanks. 22.11 Control of Spills from Aboveground Storage Tanks. 22.12 Equipment, Piping, and Fire Protection Systems in Remote Impoundment Areas and Diked Areas. 22.13 Tank Openings Other than Vents. 22.14 Aboveground Storage Tanks Located in Areas Subject to Flooding. 22.15 Collision Protection for Aboveground Storage Tanks. 22.16 Installation Instructions for Aboveground Storage Tanks. 22.17 Inspection and Maintenance of Aboveground Storage Tanks. 23.4 Location of Underground Storage Tanks. 23.5 Installation of Underground Storage Tanks. 23.6 Normal Venting for Underground Storage Tanks. 23.13 Tank Openings Other than Vents. 23.14 Underground Storage Tanks Located in Areas Subject to Flooding. 23.16 Installation Instructions for Underground Storage Tanks. 23.17 Inspection and Maintenance of Underground Storage Tanks. 24.4 Location of Storage Tank Buildings. 24.5 Construction of Storage Tank Buildings. 24.6 Fire Protection for Storage Tank Buildings. 24.8 Electrical Systems for Storage Tank Buildings. 24.9 Containment, Drainage, and Spill Control from Storage Tank Buildings. 24.10 Ventilation for Storage Tank Buildings. 24.13 Vents for Tanks Inside Storage Tank Buildings. 24.14 Tank Openings Other than Vents for Tanks Inside Storage Tank Buildings. 24.15 Detection and Alarm Systems for Storage Tank Buildings. 24.16 Inspection and Maintenance for Storage Tank Buildings. 25.4 Location of Storage Tank Vaults. 25.5 Construction and Installation of Storage Tank Vaults. 25.6 Fire Protection for Storage Tank Vaults. 25.8 Electrical Systems for Storage Tank Vaults. 25.9 Containment, Drainage, and Spill Control for Storage Tank Vaults. 25.10 Ventilation Systems for Storage Tank Vaults. 25.13 Vents for Tanks Inside Storage Tank Vaults. 25.15 Detection and Alarm Systems for Storage Tank Vaults. 25.16 Inspection and Maintenance of Storage Tank Vaults and Equipment. 27.2 Definitions Specific to Chapter 27. 27.4 Materials of Construction for Piping Systems. 27.6 Installation of Piping Systems. 27.7 Testing of Piping Systems. 27.10 Identification and Marking of Piping Systems. 27.11 Special Requirements for Marine Piping Systems. 27.12 Removal from Service of Piping Systems. 28.4 Location of Loading and Unloading Facilities. 28.9 Containment, Drainage, and Spill Control. For safety around flammable and combustible liquids, using the latest NFPA 30 is the first priority. Enforceable under OSHA and many state and local regulations, NFPA 30: Flammable and Combustible Liquids Code is the best practice widely used in industry and by insurers. The 2015 edition of the Code includes the latest and most complete criteria you need to protect your facility by ensuring safe storage, handling, and use of flammable and combustible liquids. Numerous amendments to Chapter 16 to correlate with NFPA 13: Installation of Sprinkler System rules concerning warehouse storage. The 2015 edition of NFPA 30 gives sprinkler system designers a better grasp of requirements and assists Code officials with plans review. Get the criteria you need to design your facilities for better protection, comply with sprinkler requirements, and use safe operating practices.